Unless you’re already a mortgage expert, picking between an FHA loan and a conventional loan can be tricky. Luckily, we’re about to lay it all out for you—the advantages, the disadvantages, the requirements, and how to choose. If you just want to sit back and relax, our mortgage blogger, Carter, can walk you through the basics in this short video. For a deep dive into FHA vs conventional loans, read on. What are FHA and Conventional Mortgage Loans? First, let’s take a quick overview of the whole FHA vs. conventional loan debate. FHA stands for Federal Housing Administration, which means that FHA loans are backed by the government. Originally, they were created to help make homeownership more accessible to buyers with damaged credit or minimal savings. After the housing market crashed, they became popular across all income levels and especially with first time buyers. Conventional loans, meanwhile, are your plain vanilla loans. They aren’t backed by the government, but they must conform to specific guidelines in order to be sold to Fannie Mae and Freddie Mac and then resold to investors—as most mortgage loans are, one way or another. They, too, are widely popular. Both loans offer you flexibility in type (fixed rate vs adjustable rate) as well as term length (30 years is typical, though 15 years is another popular choice). There are a couple exceptions, but we’ll get to those later. Overall, are 7 key points of difference between conventional and FHA loans. Let’s start with the biggest difference between FHA loans and conventional loans. Since FHA loans were created specifically to provide an option to buyers with low and recovering credit scores, it’s no surprise that they have the lowest credit score requirements available. That makes FHA loans a great option for first time homebuyers who haven’t had the chance to build up their credit. A credit score of 580 or over allows you to make a down payment of just 3.5%. Between 579-500, and you’ll need to put down at least 10%. If you’re leaning toward an FHA home loan, it's worth it to shoot for 580, though. Conventional mortgage credit scores, meanwhile, are typically required to be higher. It’s difficult to guarantee an exact number, since requirements vary from lender to lender and can also be contingent upon other financial factors. 620 is generally the lower limit of conventional credit requirements. Remember, though, that credit impacts interest rate. While you may be able to go as low as 620 if the rest of your loan application is spotless, the best possible rates are reserved for higher credit scores. Winner: Both. Which is the true winner for you will depend on your credit score. When most people hear “large loan,” they think “large down payment." That isn’t necessarily the case with a mortgage, though. In reality, you don’t even have to put down 10%. Or 5%. With an FHA loan, you can put as little as 3.5% down on a house. You just need to have a credit score of at least 580 and meet all other FHA guidelines (which we’ll get into later). The property must be a one-unit, single family home, co-op, PUD, or condo. Of course, many first-time homebuyers meet these restrictions anyway, so not all will find them an obstacle. Winner: Conventional. If you want to go low, it doesn’t get any better than 3%. Do FHA and Conventional Loans have PMI? Of course, if you put less than 20% down using any loan except for a VA loan, that means you’ll have to get private mortgage insurance. Private mortgage insurance (or PMI) protects lenders in the event that borrowers with low equity default on their loans—and the borrower gets to pick up the tab. When it comes to conventional loans, PMI is simple: make it to 20% equity, and you’re free and clear. That can either mean putting 20% down on the house initially, or paying PMI until you hit 20% equity with your monthly mortgage payments. Your lender should drop your PMI automatically at 20%. For FHA loans, though, the story is different. You’ll have to pay PMI for the life of the loan if you initially make a down payment of less than 10%. To get out of paying PMI, you’ll have to refinance once you build enough equity. One more downside? PMI tends to be higher for FHA loans than it is for conventional loans. The difference isn’t dramatic, but it’s something to keep in mind. Winner: Conventional. Being able to get rid of PMI as soon as possible is a huge plus. Debt to income (or DTI) ratio is another factor you’re going to need to consider when choosing conventional or FHA loans. DTI is exactly what it sounds like—the percentage of your monthly income that will go toward paying off debt (this includes your new mortgage). While the exact requirements can (again) vary from lender to lender, most will require a 45% or lower DTI ratio for conventional loans. With FHA loans, however, lenders will often offer a bit more flexibility if the borrower is in otherwise good shape. In some cases, you might see DTI ratios as high as 55% accepted. Winner: FHA. If you have a lot of debt, an FHA might just be your ticket to a mortgage. Here’s an interesting difference that you don’t hear about very often: FHA loans tend to come with lower interest rates than conventional loans. However, if this is the only factor that’s tipping you over the edge to an FHA , you might want to think again. 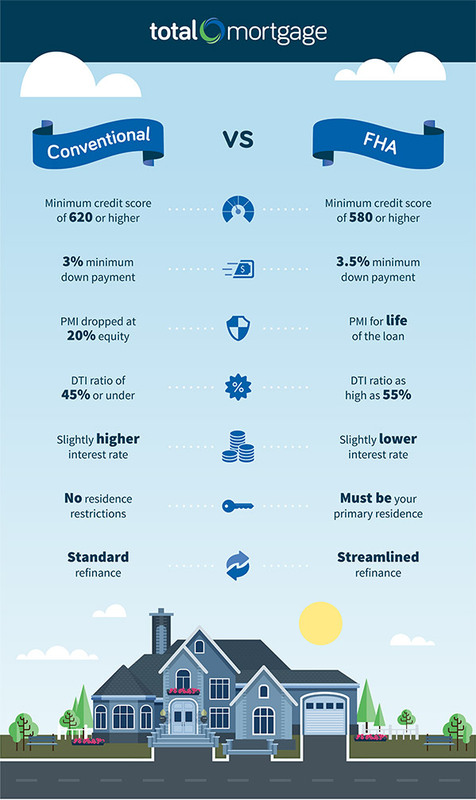 The difference between the two has historically been fairly minor, and since rates vary from lender to lender anyway, the savings that come with an FHA could easily be offset by having to pay PMI for the life of the loan. If you’re concerned with getting the lowest interest rate possible, there are other ways to get a lower rate, like opting for an adjustable rate mortgage (ARM), or paying points ahead of time. Winner: FHA. But only by a hair. Just because you qualify for a mortgage doesn’t necessarily mean your future house will. Because FHA loans are backed by the government and meant to help families, they place more restrictions on the sort of house that qualifies. Conventional loans have fewer restrictions. Second homes and investment properties both qualify, and you won't need special inspections. They, too, have a capped loan amount called the conforming loan limit. The limit is $424,100 in most areas, though that number increases in high-cost areas and for multi-unit properties. If you need more financing than that, a jumbo loan is your next step. Of course, it’s a different story if you’re planning on taking advantage of a conventional 97 loan to put just 3% down. In that case, the property must be single-family, be your primary residence, and require a loan amount under $424,100 (as outlined in our section on down payments). Winner: Conventional. When it comes to flexibility, conventional takes it, easily. Here’s one thing you might not have considered yet: what happens if you want to refinance 5 or 10 years down the line? With both loans you’ll be able to refinance into virtually any loan you want, changing term length, interest rate, and even taking cash out. For a conventional loan, this will require more or less the same process that got you the loan in the first place, though it should be much less stressful now that you’re not also trying to juggle a move. As you can imagine, that cuts way down on the time and hassle involved in refinancing. Winner: FHA. Simple and fast is always nice. Which Mortgage Loan Should You Choose? When we get down to it, neither loan is objectively better than the other. It all ultimately depends on you, your financial situation, and your plans for the future. If you want a personalized loan recommendation, check out our apply form. By answering a few simple questions about your goals and status, you'll receive a short list of loans that make sense for you.